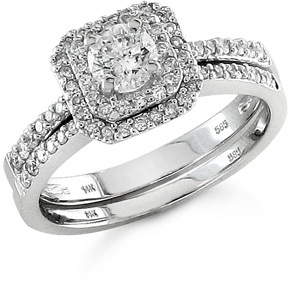 3/4 Carat Diamond Engagement Ring Set with a square set mounting and a brilliant round diamond center stone set in a 14k white gold ring. This is a 2-piece set bridal set. Center stone carat weight: 0.26 carats. Side stones: 0.47 carats. Total Diamond Carat weight: 0.73 carat total. Setting size from bottom of setting to top of ring is approx. 5mm (3/16"). Face/Top of ring measure 8mm (5/16"). When worn together, ring measures approx. 3mm wide (1/8"). Apples of Gold Jewelry guarantees the 3/4 Carat Art Deco Diamond Wedding Ring Set to be of high quality and an authentic engagement ring with real diamonds, as described above.